I see it right there, staring me in the face. It’s like a laser beam burning a hole in my retinas. I can’t help but click. That damn iOS notification red dot gets me every time. I’ve been addicted to Push Notifications since their inception with iOS 3 — and that’s in spite of the fact that they’ve more or less sucked for all but a handful of apps. But other apps like Boxcar have fixed that for me. And now Apple is on the verge of fixing them system-wide with iOS 5. While we got a glimpse of how the new system will work during the WWDC keynote last week, there are no shortage of reports out there that outline the updated feature in great detail. (Apparently Apple’s developer NDA stands for “Not Doing Anything” — as in, it’s not stopping anyone from leaking and posting on new features.) And it looks very, very good. Yes, Apple copied/borrowed some of the best features of notifications on Android and webOS (they did hire the guy who made them for webOS, after all). The truth is that they had to. Those guys were doing it right. Apple was doing it wrong. Now that it looks like they’ve nailed it, I’m scared to think of what it might result in. Currently, I turn off almost all pop-up Push Notifications except for a few (such as the Twitter app notification that pings you if a person you follow @replies you). 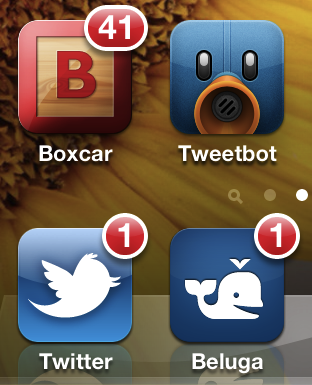 Instead, I rely on app icon badging (the little red dot), and the aforementioned Boxcar. It’s a bit of a hacked-together system, but I’ve learned to make it work for me. But as I alluded to, I have a very serious problem with the red dots. When I see one, I have to click on it. I know in my head that the update is likely not important, but I just have to know for sure. Much of my day feels like a game of Whack-A-Mole as a result. Red dot appears, hit the app, clear it. Another one? Hit the app, clear it. Etc. But it’s manageable because those red dots only appear when I actually unlock my phone. With Apple’s revamped Push Notification system, I see myself going back to the full-on pop-up notifications (which are less pop-ups and more drop-downs). And that means seeing them even when my phone is locked. I foresee it being a mixture of heaven and hell for me. It will be great because I’ll actually be getting pushed relevant information that I can see in realtime. It will be a nightmare because I will never have any quiet time ever again. You might think I’m an extreme example, and you’re right. Right now. But going forward, realtime notifications are going to become a way of life for everyone across all kinds of devices. The mobile ones are obvious, and notifications will have the biggest impact there. 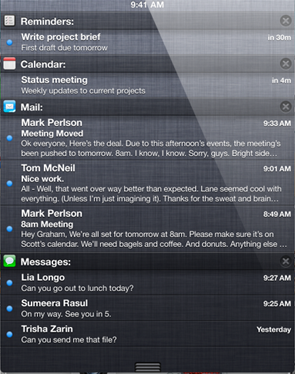 A good notification system will become perhaps the key feature for any device you carry around in your pocket. And while you might think that’s an overstatement since notifications only come one way, consider that Apple’s new iMessage system is built on top of their Push Notification platform. Two-way. Outside of mobile, apps like Growl have given us system-wide notifications for a long time. Boxcar is now in this game for moving web/app notifications to the desktop. And Apple hinted during WWDC that Push Notifications would find their way to the Mac as well. And now notifications are transitioning into the browser too. Google has been experimenting with many different types of notification systems. They range from deadly and awesome, to necessary (in the new Chrome OS). Boxcar has been moving in this direction as well. Facebook too has been perfecting notifications. This is both on facebook.com and on your desktop. Because they pump up engagement, solid notifications are a must for any serious app. You can probably expect Facebook to invest a lot more in this going forward. Then there are Quora notifications letting you know that you have a question you should respond to. And location-based notifications from Foursquare, Gowalla, and the like (Apple’s new iOS 5 Reminders app also has a location-based notification element) are becoming more prevalent. Twitter. Yammer. Calendars. iMessages. This is going to get ugly. But again, at the same time, it could be beautiful as well. As long as the notification management systems work, push alerts may actually streamline the way some people consume information in realtime. I’m both excited and scared. Okay, more scared.